Most of us (most of us reading this blog, anyway) live in a time and place where the flow of clean water on demand--for washing, drinking, sewage--is taken for granted. 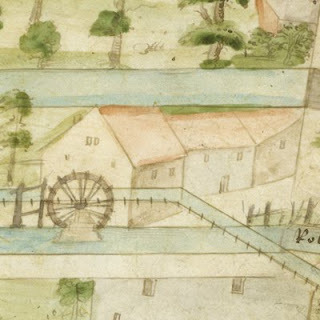 It's hard to imagine access to water being limited to stale cisterns and brackish wells (with no provision for sewage at all), but it explains why the first flow of acqueductal water into a sixteenth century city was greeted with processions of dignitaries, banners, blessings, and prayers of thanksgiving. 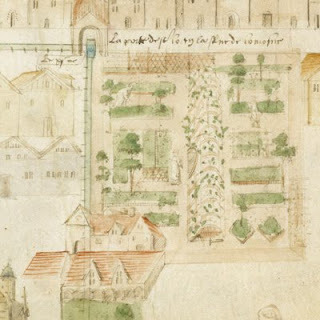 And why, in 1525, Jacques Le Lieur felt compelled to record the entire course of that water through the city of Rouen in a seventeen foot long panoramic watercolor. 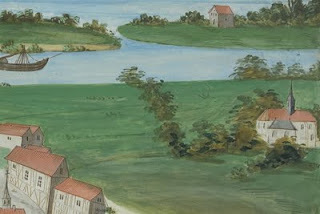 It ran past cathedrals and gardens, through mills and fountains, and Le Lieur drafted them all, creating a compelling record not just of the watercourse but of the city surrounding it, including its landscape, in his Livre des Fontaines, images of most of which are online at the library of Rouen. 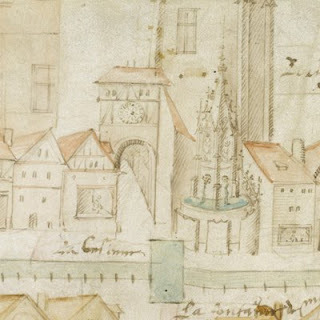 Le Lieur's 'book' is the only record of its kind from the period, in France or elsewhere, and is still studied as an early example of urban planning and public hydraulics. You can buy a copy of Livre des Fontaines (in French) here. Very interesting post... I LOVE your blog..keep these wonderful posts coming!!! Lovely! Thank you for the link! Great link. 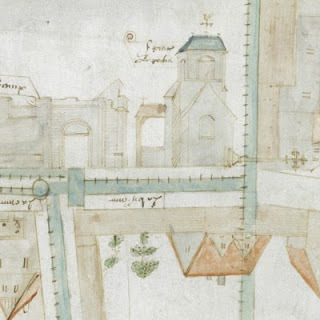 Here's one for you - a beautiful book of Dutch baroque gardens at the British Library.